For more than a decade, the Elnu Abenaki Singers have performed across the Northeast and mid-Atlantic regions. They are invited to sing at events, museums, school, and historic sites They echo the voices of their ancestors, who have lived in N'dakinna (the land) for thousands of years. The public has come to know the Elnu Singers through their repertoire of Wabanaki songs and chants; their signature Eastern style hand drums and rattles. With each new song comes an explanation of what it means and any historic information with may be related. Filmed in night vision at the Jamaica State Park archeological dig. 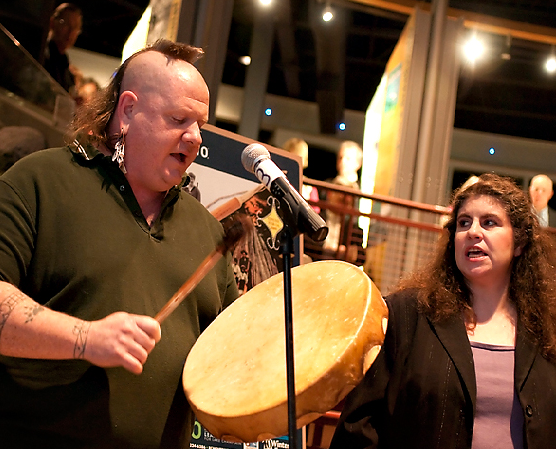 The El-Nu Abenaki Tribe Singers led the public through a night of traditional story-telling and songs. Featured here is one of those songs and the protocol that surrounds it.